Does one move make a game? Not really a trip every month, but I'm off travelling again, this time for a FIDE Rules Commission meeting, in Athens. We are still in the process of preparing changes to the FIDE Tournament Regulations, work that has been ongoing since the start of the year. One of the 'meta' issues around the Commissions work is how far does our authority extend. We can of course regulate official FIDE competitions (Olympiads etc), and FIDE Title and FIDE Rated events are covered by our rules as well. Beyond that the assumption is that tournaments should follow FIDE regulations, to provide a commonality between all organised chess events. The related issue is how to deal with tournament situations that might be best covered by guidelines (and not rules). Examples include things like re-pairing players, or the provision of tournament fillers (players who only play so there is no bye). For this meeting there is even a suggestion to provide rules for Elimination events (where players drop out after losing a certain number of points). The issues are probably not serious enough to warrant a formal set of regulations, but yet, common enough that guidance might be needed. I'm heading of tomorrow afternoon, straight after Street Chess, but I will hopefully be able to blog at the various stops as I make my way to Greece. I was tipped off* the other day about a series of posts that presented chess related data in graphical ways. The author of these posts, Randal Olson, looked at a number of different chess data sets, covering varied topics, and found a nice way to present the information. A lot of the work is historical analysis, for example charting the popularity of various openings over the years. In the early years (his starting point is 1850), 1.e4 reigned supreme, but by the 1930's was surpassed by 1.d4. But from 1950 1.d4 became less popular and 1.e4 once again become the most popular opening move. As a lot of the charts are percentage based, there are some surprising results. In the 1850's the Pirc Defence was played in over 10% of recorded games, although this can be attributed to the Cochrane - Bannerjee matchs, which contributed a sizeable number of games to the data set for those years. A mathematical problem that has nothing to do with chess. Two envelopes are placed in front of you. You are told that one envelope contains a sum of money, and the other, twice the amount. You are asked to choose one. But before you open the envelope you are told that you can swap your envelope for the other one. Question 1: Should you swap? Assuming you know a little about calculation expected outcomes, your reasoning might go like this. Question 2: Is this a valid way of making your choice? and Question 3: Can I infinitely increase my expected outcome by swapping again and again! During the so called "Romantic" period of chess history, players would sacrifice at the drop of the hat, while refusing or defending to hard against such attacks was considered bad form. This led to a number of well known games where the loser seemed helpless against the onslaught of enemy pieces. However it is possible to take things too far, as the following game demonstrates. It is a fairly well known brilliancy where Jean Rousseau plays the obligatory series of sacrifices, and even allows his opponent an extra queen. At the end Black resigns, as he cannot avoid mate or, and I repeat or, the loss of both queens. But losing the two queens is exactly what Black needed to do. In doing so he avoids mate, and as White has sacrificed plenty of material, Black has more than enough pieces to win the game. Curiously, White did miss an earlier winning line, with 11.f4!, when Black cannot survive the opening of the f file. But it is beating 2 queens that gets games published, so we are left with an unsound brilliancy. In a completely non-scientific investigation, I decided to see who were the chess worlds busiest players. My only tool was a slightly out of date database, and my copy of chessbase. A quick click on the 'sort by games' option threw up the hardly surprising name of Viktor Kortschnoi, with over 4500 games on file. Of course both the method and the data may not provide the correct answer as there is obviously filtering functions at work. The list of top players were made up of top level GM's which indicates that their games are more likely to be both published and collected. It is also likely that non-serious games (simuls, blitz etc) are probably tossed into the mix. So to be slightly more accurate, it is the busiest top players that I found. After Kortschnoi, the next human player is Karpov (a couple of chess engines squeeze in between them). The top 5 is rounded out by Gligoric, Hort and Miles, while Australian GM Ian Rogers is placed 31st, just in front of Mr Bye! Anyway, here is the earliest Kortschnoi - Karpov game I can find, from a simul in 1962. Karpov would have been around 11 years ol at the time, and the game finished in a draw. "The Grand Budapest Hotel" is in the cinemas at the moment, and I highly recommend it. During the credits, it was stated that the movie was inspired by the writings of Stefan Zweig. Of course the chess tragic that I am immediately stepped forward at this dedication, as one of Zweig's most famous work was The Royal Game. "The Royal Game" was a novella, published posthumously, about a prisoner , Dr B, who tried to stay sane by playing games of chess in his mind. After his release, due to insanity, he avoided chess, until he found himself on a cruise with the World Champion. After revealing his chess strength in a consultation game, he defeated the World Champion in an individual game. However in the next game the World Champion deliberately plays slowly to unsettle Dr B, who suffers a recurrence of his mental breakdown. The book was itself made into a movie in 1960, with the somewhat obvious title of "Brainwashed". Although the movie adds some additional characters to the book, it generally follows the spirit of the story. I spotted a couple of articles recently talking about making chess a compulsory subject in school (in the most recent case, the U.K.). Those supporting the push point to Armenia as a country that does have chess in the school curriculum, and the chess success that Armenia has had on the world stage. Of course such a proposal is often a hard sell, as schools do look for more than just having a really strong chess team, but it is possible. Amaroo School in Canberra is a school that does have chess as part of the normal class room teaching. It is taught to 3rd, 4th and 5th grade classes and takes advantage of the fact that teachers get 2 hours of PD (personal development) time a week. As there are 2 hours a week where classes require a substitute teacher, the school decided to use one of those hours to teach chess. There is a full time teacher who runs the program, and there is a dedicated chess classroom where the lessons are taught. As it is part of the wider curriculum, the lessons cover a number of things, not just how to checkmate your opponent. Students produce posters about chess, look at the history of the players and the game, and solve chess related maths problems. The program is very popular, so much so that elective classes for the older students (6th grade and up), fill up very quickly. There are a couple of other schools in Canberra who have similar programs, and hopefully it will expand, either by word of mouth, or possibly with support of the Education Department. Over at the Quality Chess Blog, GM's Jacob Aagaard and John Shaw have listed what they consider the 10 best chess books of the 20th century. The list itself is a nice collection, although it does seem weighted towards "Best Games of X" by X, with half the list being books of this kind. There are a couple of obvious choices (My System, Zurich 53 by Bronstein) and one underrated classic (Question of Modern Chess Theory by Lipnitsky). If it were my list I would rate My System a lot higher than 9th, and would try and find a place for "The Middle Game" by Euwe and Kramer. But to be honest, I probably wouldn't produce a "best of" list at all. Instead I would look at things like Most Enjoyable Book (The Fireside Book of Chess), Most Amusing (Tactics in the Ending), Most Interesting (Complete Chess Addict) or even the Most Esoteric Opening Book (Knight on the Left). Of course this is all just opinion, and I'm sure there are both alternative choices, and alternative categories. One information resource I always enjoy reading is Quora. It is kind of a crowd sourced Q&A site, where users pose questions, and lots of people provide answers. The quality of answers is quite high, as people who are either experts in the field, or have a personal question to the answer, often chime in. There are a number of chess related questions on the site, both about the game, and about ideas connected to chess. For example the first question that came up in my search was "How is Chess similar to life?" Other interesting questions are old chestnuts like "Is chess a sport?" or "What books should every chessplayer read?". But whether you've heard these questions before, or don't think they are important, I would recommend having a look, as some of the answers might both surprise and challenge you. Today is the 113th Anniversary of the birth of former World Champion Max Euwe. He became World Champion in 1935, defeating Alekhine 15.5-14.5 in their match. He only held the title for 2 years, losing the return match to Alekhine 15.5-9.5. He was still one of the worlds strongest players until just after the Second World War, playing in the 1948 World Championship Tournament. His last major event was the 1953 Candidates Tournament, although he played for The Netherlands in the Chess Olympiad up until 1962. In 1970 he became FIDE President and held the post until 1978. Most notably he was instrumental in keeping the 1972 Fischer - Spassky Match on track, as well as dealing with issues arising from the Cold War, when they intruded into the chess world. He passed away in 1981, at the age of 80 years. 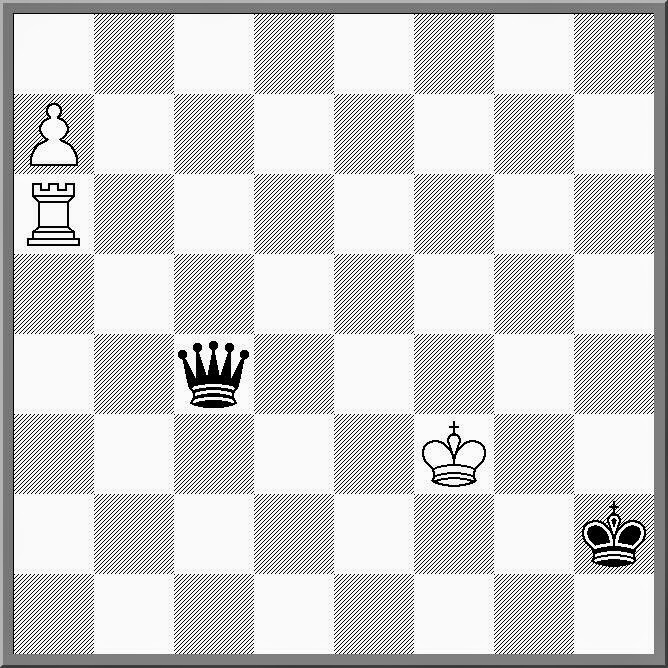 From a 1952 study, it is White to play and win. But as this is a study/puzzle you can make the safe assumption that an immediate promotion is not necessarily the right answer. When I was younger the whole "memories while sleeping" was a thing. There was even an episode of The Simpsons where Homer tried it, but his tapes were mixed up. But these days it has either faded away like crystals or pyramid power, or 8'm just not reading the inside back covers of comics like I used to. I would hazard a guess that it did not really work anyway. For if it did, the chess market would be one place it would have flourished. Grab a tape (surely an MP3) of your favourite opening, slip it under your pillow, and sleep your way to 2400. So unless those who have succeeded with this method a keeping that fact from the rest of us, good old fashioned hard work still seems to be the way forward. Another game to add to the Coffee-house collection. Played today while arbiting the regular Street Chess tournament. I actually won this game 3 times, as after walking into the double check at the end my opponent insisted on finding alternative defences, which only resulted in a further 2 losses! When I first started playing chess, opening traps were very much on my mind. Having been zinged a couple of times in positions I thought were safe, I learnt more than my share of tricky opening lines. Of course there were traps that only worked if your opponent played the move you needed them to play, but if they did not, you just ended up with a terrible position. But what does it mean when you set a trap for your opponent, but after that walk into, you still lose. Such a horrible fate befell J. Krivec in 2004. Despite being rated 2300, the trap she set for her opponent simply allowed mate in 1. Surely a candidate for the worst opening trap ever! The FIDE/ACP Anti-Cheating Committee has produced a draft proposal which will be presented to the FIDE Congress in Tromso in August 2014. It is important to note that this is a draft paper and can be amended before the Congress. Also the proposals contained in the paper require the approval by the General Assembly before they take effect. You can read a general overview of the paper here, and download a full copy of the paper from the link on that page. While I am loathe to jump in early with the "OMG!!! The sky is falling" type stories, there is some new coming out of Norway concerning the 2014 Olympiad. The Organisers has a request for additional funding knocked back by the Norwegian government and as a result are having to reassess some organisational aspects. According to this report from tv2.no the worst case is that the Olympiad would not take place in Tromso. I suspect that if worse comes to worse the Olympiad will still take place in Tromso, and the doomsday claims are about getting the government to tip some more money into the event. However if the money is not forthcoming, then the organisers may have to economise. This has happened in previous Olympiads, most recently Dresden, where the loss of a major sponsor resulted in a much tighter budget. The most noticeable effect was in the area of accommodation, but even then I thought the event (and the amenities) was perfectly OK.
As this is just breaking news there is no doubt some official announcements to come (from FIDE and the organisers). Hopefully things will become clearer sooner than later, as a number of countries have already made their travel plans for August! The design and production of chess sets is most likely going to change within the next few years. The availability of the 3D printer (at an affordable price) is likely to see people starting to produce their own sets. As long as they match official tournament specifications this should not be a problem, and in fact may prove a boon to players and clubs that are forever losing that odd pawn (or king!). And as an extension of this, I would not be surprised if the FIDE Rules Commission start receiving applications from people wishing to have their own designs approved for tournament play. The other way of creating the DIY chess set is using a laser cutter. As this medium is 2 dimensional, this is much more of a bespoke pursuit, as the pieces produced are flat rather than round. I have just seen a nice implementation of this, with the board containing slots for the pieces. While such a set is not suitable for tournament play, it has the advantage of being quite compact when stored, and may be useful for the player on the go. The 2014 Chess Olympiad is only 81 days away, and my news feed is starting to show team selections for a number of countries. Both Uganda and Bhutan published there teams today, and over the next few weeks I expect to see plenty more. The Australian teams were published in the Canberra Times on Sunday, although I haven't seen anything official from the Australian Chess Federation (For those interested: Smerdon Ly, Illingworth, Ikeda, Smirnov in the Open, Caoili, Berezina, Nguyen, Guo and Dekic in the Womens). The PNG Open team has been selected as well, and consists of Stuart Fancy, Helmut Marko, Rupert Jones, Craig Skehan, and Helmut Marko Jr.
With the travel subsidy provided by the Olympiad organisers, I expect that this may be a record breaking year. Every member of the Oceania Chess Confederation is receiving travel assistance (including New Zealand), so both the Solomon Islands and Guam should be making their Olympiad debut this year. With 5 'small' Oceania federations taking part (PNG, SI, Fiji, Palau and Guam), there might be a bit of extra competitiveness at the back of the field, as Oceania bragging rights are on the line. I haven't presented a monthly miniature for a while, as I've been missing a bit of source material (Chessvibes Openings has ceased production, and Chesstoday has only just released a few monthly collections). This miniature is actually from February 2014, and cam from the Gibraltar Open. White tries an early a3 in the Four Knights, which isn't a total waste of time, but gets run over by Black in pretty short order. Coincidently I was just discussing a similar opening the other day, which was 1.e4 e5 2.Nc3 Nf6 3.a3 The idea is to get Black to play 3. ... d5 and aim for a Qh4 (Qh5 in this case) Reversed Scotch. But after seeing this game, maybe 3. ... Nc6 is the correct reply. If there was ever an event that showed to the world that sponsors don't care about the tournament format, then the US Championship may very well be it. Over the years they have experimented with a number of different kinds of formats, without anyone saying "Of course! That is just what we are looking for". I do give the tournament organisers credit for trying new things over the years, but the fact that they have returned to a 12 player round robin shows that there is something to be said for tradition. The 2014 event is up and running right now, and you can follow it here. For those who do not follow US chess that closely will notice the absence of Nakamura (and Caruana), but the field that is playing represent a generational shift in US chess (with the possible exception of Gata Kamsky). I may have touched on this topic before, but I'm still wondering about 'hearing' versus 'seeing' as an analysis technique. My recent thoughts on this are based on a comment that was made to me about teaching juniors chess notation as early as possible. The idea is that if you know chess notation then it is easier to calculate in your head, as you can simply think "Qc5+ Kh8 Nf7+ Kg8 Nh6+ Kh8 Qg8+ Rxg8 Nf7 mate". On the other hand being able to 'see' the board in your head means you can analyse deeper, as you don't have to refer to the position in front of you as your starting point. I'm assuming we all do a bit of both, but I wonder if some players use one method over the other, and does this make them stronger? News that FIDE have yet to receive a bid for the 2014 Carlsen v Anand World Championship Match is probably a symptom of a issue that is now just coming to a head. This is the question of how often a World Championship Match should be held. Between 1948 and 1984 the World Championship title operated on a 3 year cycle, although there were some matches played out of sequence, due to the defeated champions 're-match' clause. The after the aborted Kasparov v Karpov Match in 1984 there were matches in successive years, until 1987, when it all settled down again. The Kasparov-Short split with FIDE in 1993 heralded a succession of format changes, until things returned to normal in 2008 when Anand defeated Kramnik to unify the title once more. It was thought that FIDE were sensibly going to stick with a two year cycle from then on, but this seemed to change with the involvement of new commercial partners. The 2012 Anand-Gelfand match was followed by the 2013 Anand-Carlsen Match, and the 2014 Carlsen Anand match is scheduled for the end of the year. This surfeit of World Championship Matches seems attractive, if their is the available sponsorship money to support it. But even if there is, deciding the title this frequently is still problematic. It does take away the gravitas of being World Champion, if you might only hold it for a single year, although this did not take the shine off Smyslov and Tal's achievements. It also impacts on other issues further down World Championship hierarchy, specifically the World Cup and Zonal events. These are held every second year, and so lining them up with a specific World Championship match can be confusing. So while it is understandable that FIDE takes advantage of the importance of the World Championship match, overdoing it may result in a loss of prestige and commercial return. The 2013/2014 4NCL season (the UK's teams tournament), ended like it did in the previous year, with Guildford finishing ahead of Wood Green after winning their final round match against there closest rivals. The 'Big 2' once again dominated the event, with a slew of GM's turning out for both teams. There final round match up was incredibly strong with Guildford averaging 2656 over 8 boards, slightly ahead of Wood Green who only averaged 2647! But while the ratings might have predicted a close match, Guildford easily won 6-2 to take the title. Of the remaining teams, White Rose did the best, finishing in third place, and qualifying for the European Club Championships. This was more a team of 'part timers' although they did ship a couple of GM's (including GM Dejan Bojkov) for the crucial matches. Note should be made of the performance of WIM Sue Mararoa Jones, who scored her first IM norm, as well as her first WGM norm, while playing for White Rose. My son was relating to me a dream he has the other night, where he became a Zombie Chess GM. In the dream he was playing a Grandmaster, who also happened to be infected by a zombie virus. By playing the ZGM he also became a Zombie, with the side effect that his chess ability improved to GM level. I'm not really sure this is part of Zombie canon, as no ones brain seemed to get eaten, but at least some of the elements are there. Doing a little research on the topic I came across more than one ruleset for 'Zombie Chess'. Some involve resurrecting captured pieces, some involve the shambling hordes, and some involve special pieces. Not having time to go through them I'll throw my own (possibly already invented) game into the mix. Simple rules: White plays as normal humans, Black is the zombie army. Zombies move one square forward or diagonally forward. Any piece captured by a zombie becomes a zombie (occupying the square that the capturing zombie moved off). Any zombie captured is removed from the board. Humans win by capturing all zombies. Zombies win by getting a zombie to the back rank. Is the game playable? No idea! One of the players who took part in the 2014 O2C Doeberl Cup was untitled Chinese player Ke Mu. Despite his low rating (2325) he had a fantastic tournament, scoring a GM norm at the Doeberl, and missing an IM norm at the SIO by 3 rating points (TPR of 2447). But he mat have been helped by a misunderstanding early on at the Doeberl. It was mentioned by a couple of people that he had already scored enough GM norms for the title, but was just waiting for his rating to catch up. The claim had a ring of plausibility about it, as he had started with a very low FIDE rating early on, and players preparing for him remarked how strong his play looked. Possibly this reputation as a GM strength 2300 player helped Ke Mu, as his opponents might have been extra wary of him. But when talking to him at the SIO I discovered that the claim of multiple GM norms was not true, and he was not aware of it himself. In fact the GM norm at the Doeberl was not only his first GM norm, but also counted as his first ever IM norm. But he clearly showed himself to be playing at a higher level than his rating, including the following win over current Australian Champion IM Max Illingworth. On the 17th April, the newsreel company British Pathe made over 85,000 historical clips available on youtube. The clips cover the big events of the 20th Century, with the earliest clips dating from 1890. Of course I checked out what chess clips they had, and they quite an interesting collection. There are a number of famous chess players featured, although the biggest collection seems to focus on Soviet Championships from the 1950's and 1960's. There is coverage of the 1958 and 1961 World Championships (both won by Botvinnik), but the one event I could not find was the 1972 Fischer v Spassky World Championship Match. You can either head over to youtube to find the clips but probably easier way of finding what you are after is to go directly to the British Pathe website. While I went looking for chess, I'm pretty sure there are plenty of other interesting topics to explore. If you are just starting out in chess, or trying to teach other people how to play well, then simply looking one and a half moves ahead might be all you need to focus on. This is the system recommended by Charles Hertan in his book "Power Chess for Kids", and like a lot of good ideas, its strength is in its simplicity. The subtitle of the book is "Learn how to think ahead and become one of the best players in your school", and clearly shows the market he is after. I am often surprised at the number of new players who seem to focus on complicated opening theory, or 5 move combinations, when simply finding the one mover's is enough. In Hertan's book he even makes it simpler than that, by suggesting you focus on finding the third move in a capturing sequence (which he calls 'takes, takes, bang!'). And based on my own experience, this is not only a step up from 'I move, ... ,then I move again', but would result in vastly improved results from your average school chess player. Despite being quite The Beatles fan in my youth, I just discovered a chess/Beatles cross over I was not aware of before. According to Ringo Starr, he found his drumming talents rarely called upon while recording "Sgt. Pepper's Lonely Hearts Club Band" , so much so he had a lot of spare time in the studio. He is quoted as saying "The biggest memory I have of Sgt. Pepper ... is I learned to play chess"
Of course you normally don't learn chess on your own (at least in those days), so I wonder who taught him to play? I was watching the following game during the last round of the 2014 Sydney International Open. Of course this was because one of the players was my son, but also because of the choice of opening (the Frankenstein-Dracula variation). Having played the black side of of it on occasion I was interested to see how it would turn out. Once White played 7.h4 I figured it would be a routine hack down the h file with an eventual mate on h7 or h8. By the time I returned to the game the players reached move 20, and to my surprise Black had weathered the attack and looked to be a solid pawn up. It was then that White uncorked 21.Rxd5 which on the surface looks like a brilliant move. Certainly it posed enough problems for Black that White looked liked he'd reached a winning ending after lots of material was exchanged, and when I saw the players shaking hands I'd assumed Black had resigned. In fact White had offered a draw on move 30 and Black had wisely accepted. Analysing the game later (with the help of an engine) it turned out that both sides had better moves, but if they had played them, it would have been a completely different (and less interesting) game. And most likely, White would not have had the opportunity to play Rxd5! !.